The big data could transform the healthcare sector accelerating value and innovation. 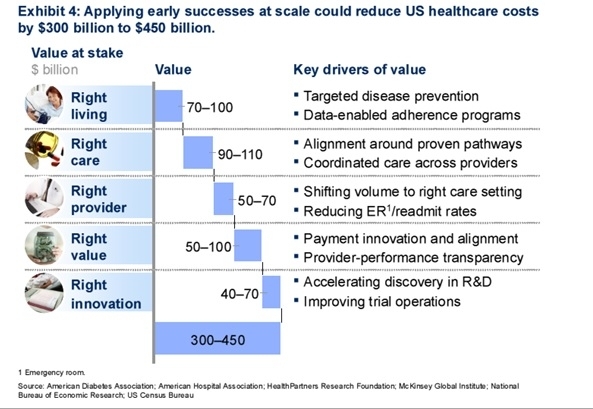 The use of “big data” could reduce the US healthcare costs by $300 billion to $450 billion, but the industry must undergo fundamental changes before stakeholders can maximize on its full value according to new report from McKinsey & Company. The report, The Big Data Revolution in Healthcare: Accelerating Value and Innovation written by Peter Groves, Basel Kayyali, Steve Van Kuiken, and David Knott discusses the analytic capabilities that will be required to capture big data’s full potential for payors, pharmaceutical companies, and providers. Patients can build value by taking an active role in their own treatment, including disease prevention. The right-living pathway focuses on encouraging patients to make lifestyle choices that help them remain healthy, such as proper diet and exercise, and take an active role in their own care if they become sick. Pathway involves ensuring that patients get the most timely, appropriate treatment available. Right care requires a coordinated approach: across settings and providers, all caregivers should have the same information and work toward the same goal to avoid duplication of effort and suboptimal strategies. This pathway involves the identification of new therapies and approaches to delivering care, across all aspects of the system, and improving the innovation engine themselves. To capture this value, stakeholders must make better use of prior trial data- such as by looking for high potential targets and molecules in pharma. The data can used to find opportunities to improve clinical trials and traditional treatment protocols, including those for births and inpatient surgeries. It is estimated that the pathways could account for $300 billion to $450 billion in reduced healthcare spend, or 12 to percent of the $2.6 trillion baseline in US healthcare costs, as shown in the graph below. For more information, visit McKinsey & Company to view the full report.